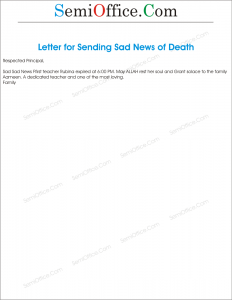 Sample letter or email for sending sad news of death of friend, father, mother, son, daughter or any siblings to office, company etc. Obituary sample for father, mother, uncles and all other relations. We are very sorry to tell you that Mr. Clark who served as Assistant manager in our company has died due to heart attack. We have indeed lost a good friend and a Great person. Its hard period for his family and colleagues. His work in our company was worth appreciation. May his soul rest in heaven. 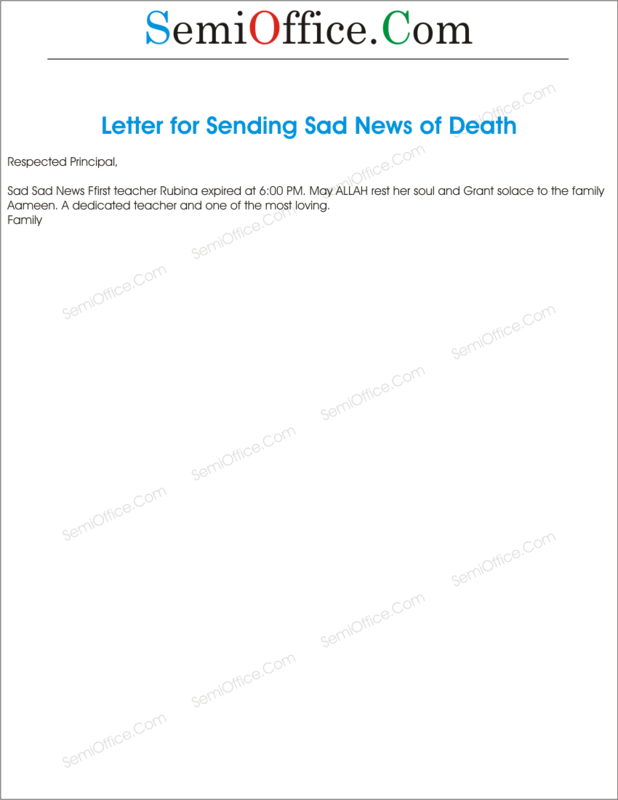 Sad Sad News First teacher Rubina expired at 6:00 PM. May ALLAH rest her soul and Grant solace to the family Aameen. A dedicated teacher and one of the most loving teacher of your school. I am in a state of great grief to inform you that my maternal uncle has expired the last night as he was a patient of a chronic liver disease. It is further stated that his funeral ceremony has been scheduled at 4.pm today. By the virtue of this letter I request my colleagues to attend it for the forgiveness of the deceased. This pains us to inform you that Mr. Brett Lee who has been working as a Manger Operations for United Bank London, has passed away from cardiac arrest this morning (may his soul rest in peace). You are requested to please take his body into your custody from the dead house of Care Hospital at your earliest and contact with the Bank for the provision of monetary aid to his family and that could also be used for his sepulture. United bank acknowledges the efforts of Mr. Brett Lee being an employee and stands with his family in the time of need. Sir, with full regret I have to inform you that my father who had been in the ICU for the last 3 days passed away. My mother had died when I was 11 and losing a father now is devastating for me. Being the eldest amongst siblings, this brings a huge responsibility on my shoulder. The funeral will be held tomorrow at JD Cemetry, Houston. May his soul rest in peace. Amen. 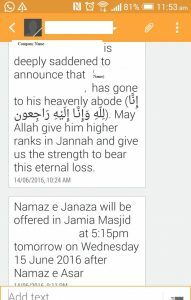 It was painful news of death of your dear father. I was in Pakistan when he met with a road accident. He was seriously injured but I was hopeful for recovery of his health. When I met him last time in hospital he wished me a successful career in a very kind way. He was not only a man of letters but also a social worker and pious man. He used to advise his Youngers to play a kind role in society. Everyone had a big loss of such a great personality. He is not a man to be forgotten. 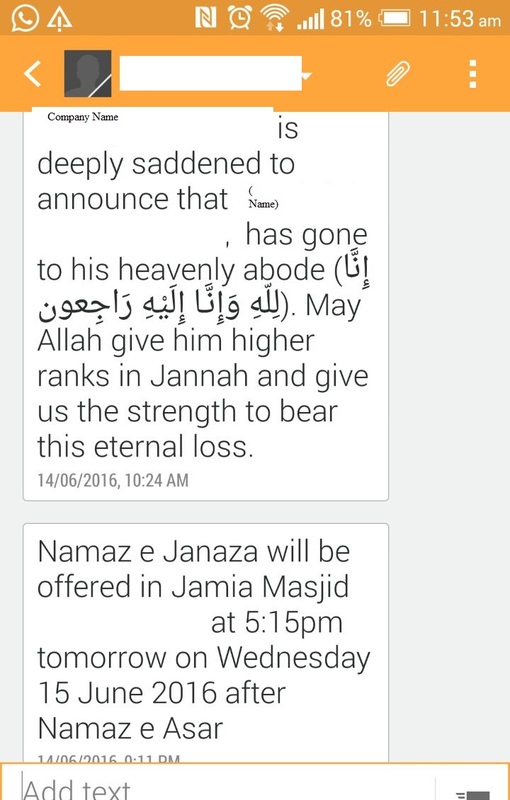 I am really sorry I could not join his funeral ceremony as you know I had recently joined Dubai firm and they did not allow me a leave.